If you would like to mass import your users, you can take advantage of the CSV importer. 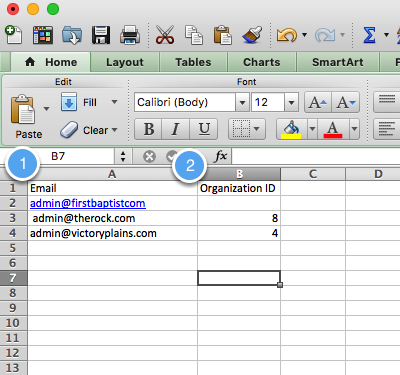 This will allow you to create an Excel, or CSV document, add all the churches to the document and then import them into Church Metrics. This can save you a lot of time if you have multiple churches you are importing. After logging into your Groups account, you will click the "Churches" tab at the top of the page. This is only available if you have setup a groups account. If you would like to be setup as a group, please contact help@churchmetrics.com. Click the "Invite" button to advance to the Invitation page. Once on the invite church screen, download the "CSV Template". Add the email of any admins on the account. If you know the Church&apos;s Organization ID you can add it here. After you have saved the CSV to your computer, select "Choose File" and attach your file. Once the file has been selected, click "Import CSV" to advance to the next screen. You will be able to review your CSV file before the import. If there is an error with an email or church it will be highlighted in red. You can click on the email to edit it. If you would like, you can also remove the email from the import. If the user has an account, it will show a green check and have no extra text. 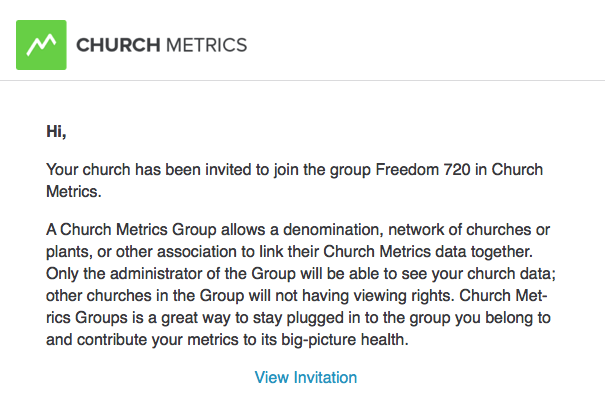 If the email is valid but they are not a part of Church Metrics, you will see a message letting you know that the person will be asked to create an account. Once you have corrected all errors, you can import the file. Once you have sent the invites, the church will receive and email similar to the one above. They can click "View Invitation" to login.